Just to give you some perspective! Yes, I debated yesterday, and this morning decided no. Then coming back from the Post Office this afternoon I said, “Ray, if you don’t do it you will regret it.” Now, just don’t tell Cathy I did, I promised her no ladders. I packed into a backpack my IPod for a panorama, my Canon for pictures and video, and Nikon for more pictures, and off I went and climbed and climbed. Note to self, charge Nikon if not been used for ages, and remember how to turn on IPod to use it. So, everything here is from the Canon. I have a number of images taken from this vantage point in the 1870s and 1880s from the cupola from the first Town Hall, and wanted to replicate them. But that is not really possible because of all the wires now, and those earlier images are in the fall without leaves or with snow. But, you don’t get to see this, and I had to share. Click on any image to open a larger gallery. Looking north over St. John’s Episcopal Church. Moving the camera to the east. Looking towards “downtown” and Burdick’s. Now looking south over the church to my house. 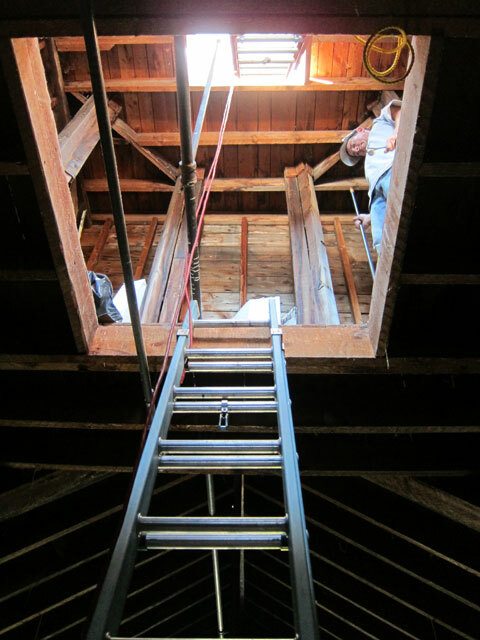 And, then I had to go back down, three ladders. These are views you probably will never see again. 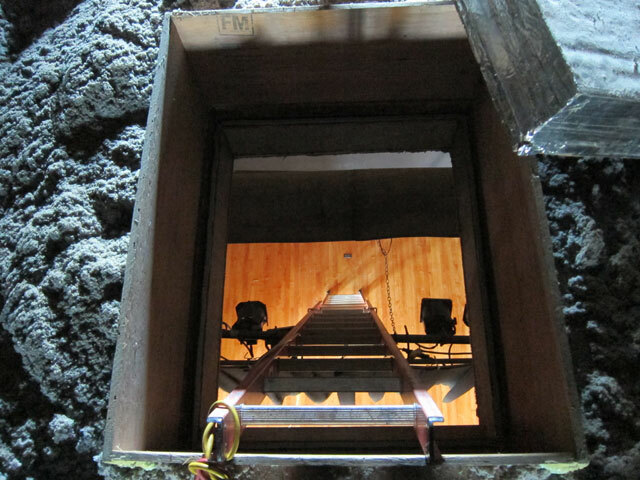 Looking up into the lower level of the cupola and you can see the ladder to the exposed tippy-top. 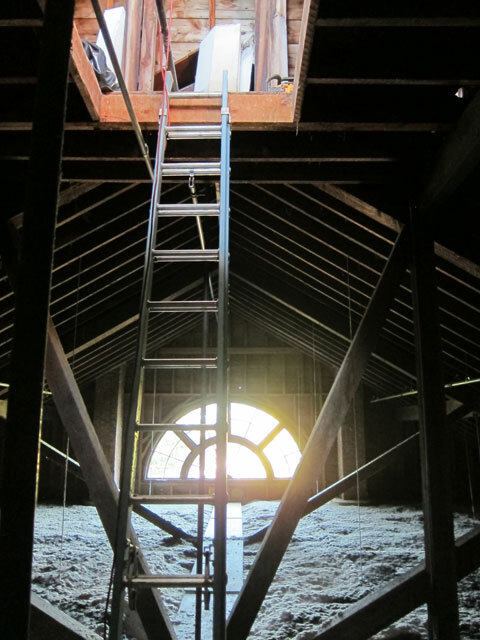 Ladder from attic space above the second floor theater to the cupola opening. And a view of the stage (showing the tallest of ladders) you will never see either. I am home and safe, and even though I realized I had not pushed the on button on my IPod to take a panorama with special software, I do not think I will go back to try. But then again, this morning I decided I would not go up. You knows?? 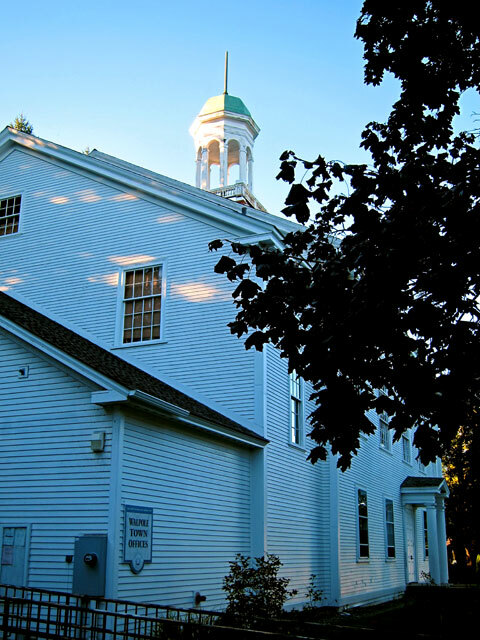 This entry was posted in Miscellaneous Musings and tagged New Hampshire, NH, Town Hall, Walpole. Bookmark the permalink. You go Spiderman! You wouldn’t believe some of the high elevation hikes and cliffs Betty has done this trip, now you’re both ready to climb anywhere. I know, what I do is nothing compared to you guys !!! Yikes, if I could find a way to rat you out to Cathy, I would…I might have done some high hikes this trip, but ladders I do NOT like! Actually, though, I can see why you did it, those are some great pictures! Ray — it looks like fun! I remember climbing up to that loft above the second floor of Town Hall with Bill Perron and Ben Northcott when we installed the back electric pole for Midsummer Night’s Dream and teetering over the planking to get to the rear of the hall. Looks like you found a more direct access directly from the second floor. You should go up once more when the foliage is peak….